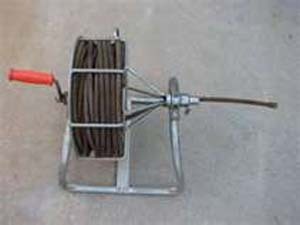 The Spin-Drive is a lightweight easy-to-operate manual drain cleaner for 2 in through 4 in drain lines. A comfortable metal handle on the crank turns the cage smoothly on self-aligning oilite bearings mounted on the front and rear of frame. A convenient carrying handle is mounted on the cage for easier portability. Equipped with Flexicore wire rope center cables, assuring the strength and flexibility to do a good cleaning job. Copyright Hallman Equipment Rental. All Rights Reserved.